Hang the poster in your office, assessment room or fitness/rehab studio for a constant reminder of how to perform the NPI's 4 Points of Posture™ Program. The poster is large enough to be easily read from a distance, yet small enough to fit on almost any wall. It draws attention from across the room. 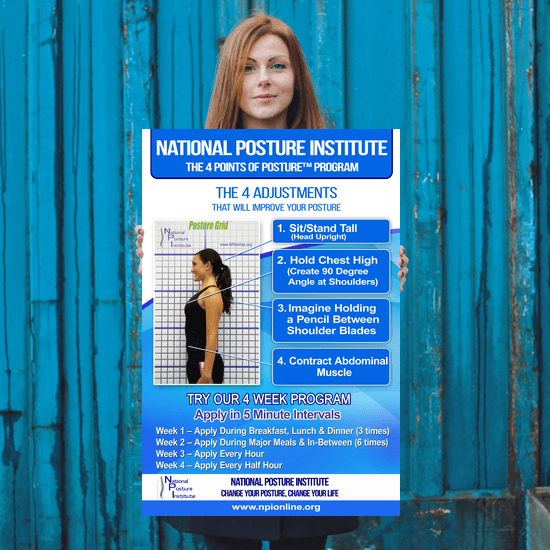 This official poster from the National Posture Institute will help increase & maintain the credibility of your posture correction services. While we specialize in certifying Posture Specialists, we acknowledge you may need time before joining our team. You can still help us improve posture with our NPI-4 Points of Posture™ Program and this Posture Poster! Please allow 5-10 business days for fulfillment and shipping. *Free Shipping not valid on express or rush shipping or for shipments to AK, HI, APO/FPO locations or U.S. territories. Free Shipping not valid on international shipments. Not valid for cash. No adjustments will be made to prior purchases. National Posture Institute reserves the right to change or cancel this promotion at any time. 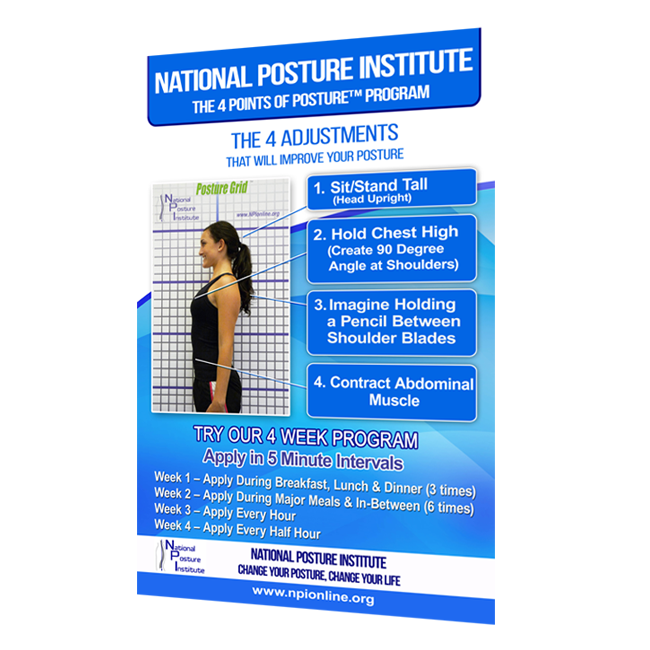 The official National Posture Institute 4 Points of Posture™ Poster. By the end of the four weeks you will see noticeable, positive changes in alignment! Pick up your copy today. Don't miss a chance to incorporate this into your current practice and make a difference in the lives of your clients! 30 Day Guarantee: Not satisfied with your order? No problem! We will refund your money for your order. All you have to do is ship back the poster to us. Once we receive it and can confirm it is still in good condition, we will refund your order. Any claims for misprinted/damaged/defective items must be submitted within 30 days after the product has been received. For packages lost in transit, all claims must be submitted no later than 30 days after the estimated delivery date. Claims deemed an error on our part are covered at our expense.